I often like to challenge myself. But more times than not appreciate the challenge presented to me by others. The homie Dj Stone hit me up to drop a Drum & Bass/Jungle mix for his radio show. But I honestly haven't been up in the scene as much as I probably should & really didn't have any current trending tunes. Just the classics & a lot of my own personal selections that I've incorporated in previous mixes over the years. That's when the lightbulb went off. Why don't I rework & produce my own Drum & Bass/Jungle tunes for this mix. So I started with a break, seasoned it with a sample, added elements of turntablism & various other production technics. Two weeks later I felt the canvas's had enough paint & now I'm ready to share my masterpiece with the world. I titled the album "Broken Needlez #22 Outerlimits Mix" to reflect my continued growth in sound of one of my favorite mix series & as an ode to my very first attempt at making Drum & Bass; "Outerlimits". Which is featured on "Migraines Uv Melodies #1" released on Cd close to fifteen years ago. Sheesh, how time flies . . . This album is dedicated to those who's ears are tuned & who's minds are in tune with something just a little different. I welcome you to take this journey with me to the outer limits. S.O.U.L.-O. 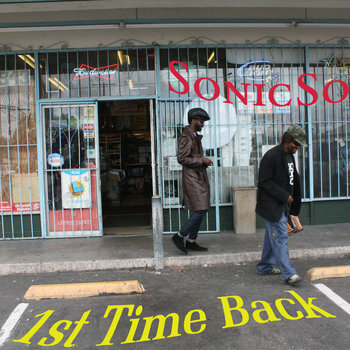 The debut instrumental album from Sonic~Soul. 1st Time back is a roots, dub joyride to the other side of fresh!!!! Strap in & enjoy dem ill riddims!!!! The tenth installment in the on going Migraines Uv Melodies Instrumental Mix series. S.O.U.L.-O. treated fans in the previous Migraines Uv Melodies to the rawest of instrumentals from an assortment of talented producers living all over the world. Now he's giving his fans a dose of all original instrumentals that will have all listeners in a fifty foot radius nodding so hard they'll need a neck-brace. Download Your Copy Of The Album Today!! !